How to aggregate points to polygons using ArcGIS Desktop? I am trying to aggregate my data points to the polygons so that I could find out how many points I actually have in each polygon, and then export the data contained within each polygon to further look at the data properties as they pertain to each polygon. What you want is a spatial intersection of your polygons and points. 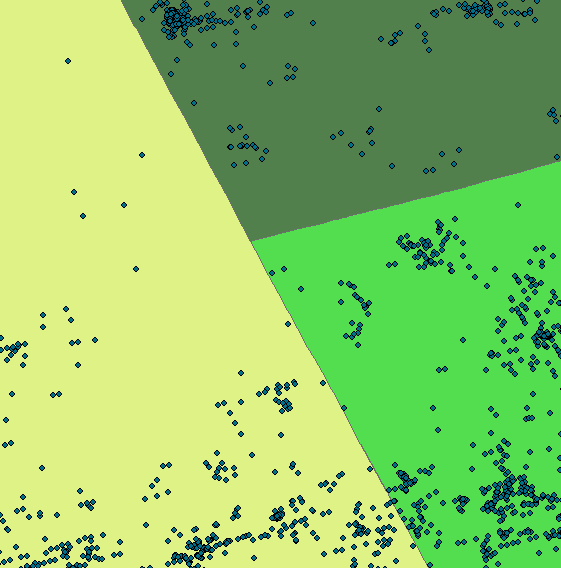 You can use the Select By Location tool if you only have a few features and would like to export separate layers, or you could run the Intersect tool to output a new point layer to which you can add the intersecting polygon ID/name as an attribute, which can then be used to sort the data by polygon. Since you mentioned exporting the data to Excel for analysis, I would run the Intersect tool and then export the resulting attribute table. Using Identity Toolbox maybe can meet with your need. The point layer as the Input Feature and the polygon layer as the Identity Feature.The polygon's attribute with be contain in the point's table ,so your can found out how many points in a polygon. Hawth's Tools is a very handy (free) ArcMap plugin which automates many similar commands, including Count Points in Polygons. Not the answer you're looking for? Browse other questions tagged arcgis-desktop arcgis-10.0 polygon aggregation or ask your own question. How do you Aggregate a set of points that lie within different sections of a polygon?